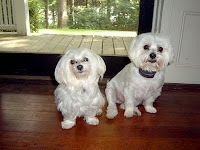 Skylar, a 10 year old Maltese, was recently adopted from our shelter by a family that already had a Maltese of their own. We were very happy to receive this photo and a nice note letting us know how well she had adapted to her new home and new canine brother. That's Skylar on the left looking as cute as ever.